Ask any Human Resources representative and they will tell you that safety comes first in the workplace. Whether your employees work inside or outside an office, we carry the tools, signage, and apparel to keep your employees safe. When it comes to workplace efficiency, the least expensive program is a preventative one. Investing in the proper safety items can save your company greatly when compared to absenteeism, workers compensation claims, OSHA citations, and other penalties. 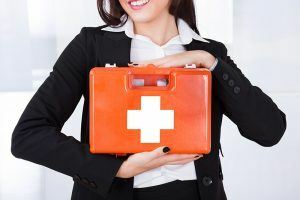 We carry safety items for all industries from basic office first aid to healthcare and manufacturing. Stinson’s works with qualified safety specialists that keep us up-to-date with the latest OSHA, ANSI, and other government requirements and changes. We carry the supplies that you need to protect your workforce.